Pestriad Plaid Shirt and Sarafan, late 19th-early 20th century. Vologda and Arkhangelsk regions, Russia. Private Collection of Susan Johnson. See item description for specific details. A loosely fitting sleeveless dress worn over a shirt, the sarafan was common in the rural regions of Russia. The sarafan costume consisted of a long-sleeved shirt, a sarafan, a scarf and a belt. A belt was a mandatory component of Russian dress. “It is a sin not to wear a belt,” cautions an old Russian saying. 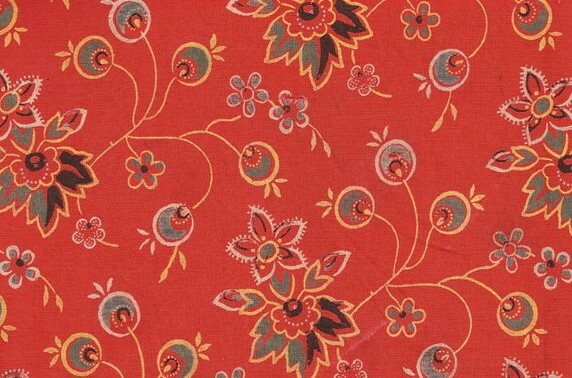 In the 18th century, the sarafan was already perceived as an essential component of the Russian national costume. The sarafans of the Vologda region are made of homespun and handwoven linen. The red sarafan is made of thick linen pestryad woven from linen thread of different colors. Draped over the head is a scarf from the Rubachev factory in the town of Shuia, Ivanovo region. The blue sarafan is made of printed linen. The linen shirts are homespun, hand woven and hand sewn. Both costumes were made in the Vologda region in the early 20th century.